Hippopotamuses live in Africa and are the 3rd largest land animal. They are herbivores, which means they eat vegetation, and they live in large groups called pods. 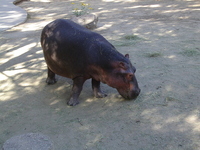 Hippos have huge hairless barrel shaped bodies with large mouths and big teeth. They have short legs but can run faster than a human. 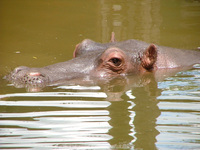 Hippos can hold their breath for up to five minutes under water. They automatically come to the surface for a breath even while sleeping. 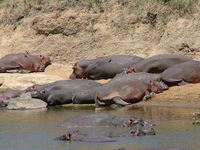 Hippos are one of the most ferocious and ill-tempered mammals. They can and will attack crocodiles. Only the young need to be concerned of becoming prey. Hippos who are large, strong, ferocious, able to run fast, and can kill crocodiles should not be afraid of anything. That is true except for Adofo, pronounced Ah-DOH-Foh, meaning brave warrior. Hippos spend most of their lives in the water, all except for Adofo. He is very afraid of the water. Every time his mom tries to get him into the water he screams and runs away. He would much rather cool off in the mud. In fact, he loves the mud and that is where he spends most of his time. When she coaxes him he will sit near her close to the water’s edge. Sometimes he will get his feet wet but then walks back to the safety of the mud hole. What is a mother to do? She sees real fear in his eyes every time she even suggests he go into the water. The other young hippos tease him, but still he will not go into the water. One of the other moms suggested his mom shove him into the water. She thought that might work. She nudged him close then knocked him in with her mighty head. Adofo went into the water head first with a Splash! Up he came sputtering and as quick as he could, he climbed out and ran away! He ran until he fell down from exhaustion. He then crawled under a tree for shade. Later his mom found him with his eyes tightly shut and still shaking. “Honey, I thought if you went in and realized it wouldn’t hurt you, you would get over it. I’m sorry you were so frightened.” Mom said. Adofo nodded. He got up and they both started their evening meal of grass. When it was dark it was much cooler. Mom was relieved for Adofo, and Adofo was glad he could cool off. The sun was just peaking over the horizon when Mom woke him to go back to the mud. He started to protest, but she wouldn’t hear it. Slowly he got up and walked beside her back to the mud hole. He rolled in the mud and let it sooth his parched skin. He realized then, she had been right. The mud felt so good. His mud hole was close enough to the water he could see and hear the other hippos. The young ones were opening their mouths and taking in a lot of water then spewing the water like a fountain. Their grunts, splashes, and laughter made him envious of their fun. Days went by but he didn’t go any nearer to the water. He rolled and lay in the mud during the day and grazed on grass in the evenings. He was lonely because he would not go near the water where the other hippos were, and his mom told the others to leave him alone. She only came to check on him once a day and grazed farther from him than she had done previously. She kept a watchful eye on him but left him alone. Adofo was worried. He was afraid something happened to her. He did something he thought he would never do. He walked right into the water and swam to where he had seen her disappear. He swam for a very long time when all of a sudden there she was! He was so happy to see her! Adofo was surprised! He realized he was in the middle of the water! He forgot he was afraid of the water. He was all right. The water did not hurt him! All of a sudden he started to giggle. He swam in a circle then dove underneath the surface. Laughing, he came out and squirted water at his mom. She joined him in his laugher then said, “I knew you could do it.” Then he realized she left the pod just to get him over his fear. She loved him so much she left her family. She was all by herself waiting for him. He knew she would have waited for a long time just for him. Adofo loved his mom more than he was afraid. He put her safety before his fear. He learned his fear was not what he thought it was. He was brave getting into the water and going to find his mom. Adofo was never afraid of the water ever again. Boys and girls, is there anything in your life that you are afraid of? Your parents can help you overcome your fear. What you need to do is talk to them about it and they will help you. Overcoming a fear is difficult but not impossible. There will be times in your life you have to do something that is scary. It may be talking, singing, or playing an instrument in front of a large group. You may have to shoot the basket that wins the game. You might be the pitcher who has to strike the guy out. Going to a new school or church can be frightening. Sometimes there are strange noises or dark shadows in our room at night and you need to be brave. The first time you try to ride your bike and fall off, you need to get back on. If you lose the game for the team, it is okay; you need to get back out there and do your best next time. Life is full of things that can frighten us or make us not sure of ourselves. That is part of growing up. Ask your parents when they have been afraid. We all get afraid sometimes. What we need to do is overcome our fear. That is when we need to ask the Lord to help us. He is always there and will go with you through things you are afraid of. The Lord says in Isaiah 41:10 Fear not, for I am with you; be not dismayed, for I am your God. I will strengthen you, yes, I will help you. I will uphold you with My righteous right hand. Deuteronomy 33:27 The eternal God is your refuge, and underneath are the everlasting arms; He will thrust out the enemy from before you and will say, ‘Destroy!’ The Bible also says in Philippians 4:13 I can do all things through Christ who strengthens me. Psalm 4:8 I will both lie down in peace, and sleep; for You alone, O Lord, make me dwell in safety. My favorite is the chapter of Psalm 91. It is always a comfort to me. You can find it in your Bible. Memorize: Philippians 4:13 I can do all things through Christ who strengthens me. Or Isaiah 41:10 Fear not, for I am with you; be not dismayed, for I am your God. I will strengthen you, yes, I will help you. I will uphold you with My righteous right hand. You can listen to this Bible verse put to music by clicking here and selecting Isaiah 41:10.